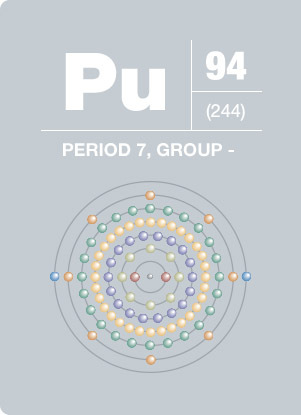 Named after the planet Pluto, plutonium was the second transuranium element of the actinide series discovered. Its appearance is silver-white, though it tarnishes to yellow when slightly oxidized. The isotope 239Pu has a half-life over 20,000 years; one kilogram produces over 20 million kilowatt hours of heat energy. Applications of plutonium include use as an explosive ingredient in nuclear weapons and as a key material in the development of nuclear power. Because of the energy given off by alpha decay, a large piece of plutonium is warm to the touch. Although plutonium occurs naturally in trace amounts, most existing plutonium has been created from fissile activity, particularly in nuclear power reactors.